Just like when you are meeting someone new, you must get your caller to like you, too. Being a call handler is a personal position—you are talking to people daily, using aspects of psychology to interact with the customers, get them to like you and the business you are working for, and ultimately choose you over any competitors. This is why it is important to build rapport and connect with the person on the other side of the phone. People need to like and trust you, immediately. It isn’t quite so simple and natural for some people as it is for others. Now, you don’t need to be a social butterfly or super outgoing to be successful in rapport building. 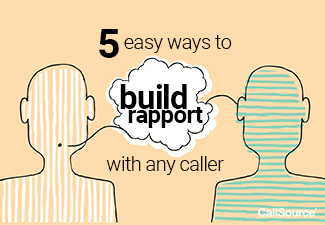 Here are a few tips to make sure your rapport building skills are top notch for that next inbound call. As the call handler, you should be in control of the conversation; you still want to make sure you find time to pause and listen to the caller’s issue or needs. Recently we mentioned personalization is one of our best practices for inbound phone handling. Personalization goes hand in hand with building rapport with a potential customer. One of the first questions you, as a call handler, should be for the person’s name. After asking for their name, make sure to use it throughout the call as well in a genuine way—don’t just insert it every in every sentence. “Service with a smile” isn’t only a good slogan for the food industry. The whole mopey, drawn-out voice may be cute and work on Eeyore, but it doesn’t work in rapport building! A humdrum voice won’t get the caller to like you—put some pep in your step! (Or, in this case, your voice). Oh, bother! Of course this isn’t like any conversation you’d have at a party or chatting with a friend, but still—you don’t want to get right to your first question on your phone script and sound like you are rushing through the call or simply checking off boxes. Ask the caller how they’re doing and how you can help them. Remember, it’s a conversation, and there is a real person on the other end of the phone. People like others who ask questions about them and are good listeners. In a series of experiments by Harvard Business School students, participants had to ask people fewer than four questions, or a minimum of nine questions, while in conversation. Not surprisingly, people ended up liking those who asked at least nine questions better. They also found that not only asking questions when chatting but asking follow-up questions makes a big difference. This shows that you are interested, that you are truly listening, and also want to learn more about the other person. As the call handler, you should be in control of the conversation; you still want to make sure you find time to pause and listen to the caller’s issue or needs. Repeat back to make sure you correctly understand what it is they are looking for, so they know that you are hearing them. After actively listening to the caller’s problem or need show empathy. If someone is calling saying that their air conditioning broke and it’s a hot day, you don’t want to sound robotic and just ask for their address or whatever is in your protocol next. First, take a moment and show empathy—phrases such as “I’m so sorry to hear that” or “we can definitely help you with that” work and make the caller feel like they are not just any other person calling into your business. Want more tips on improving your call conversation quality and boosting your appointment-setting skills? Be sure to subscribe to our blog, and feel free to speak to a CallSource representative to hear about our Telephone Performance Analysis and Call Coaching programs!